Our live coverage of Donald Trump's visit to Southwest Florida. He will be accompanied by First Lady Melania Trump and Vice President Mike Pence. 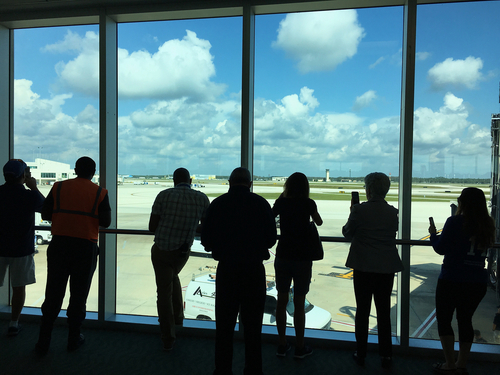 People looking for President Trump as Air Force One just landed at RSW. Vice President Mike Pence says Trump has "directed the full resource of the government to help and rebuild after Hurricane Irma." President Trump introduces Gov. Rick Scott. Calls him "absolutely outstanding." Rick Scott thanks Trump and Pence. Says they were always available. He also thanks law enforcement. The president says in Fort Myers, Florida, that he hopes Scott "runs for the Senate. I don't know what he's going to do." Trump says alongside Scott and other Florida officials that he knows "at a certain point it ends for you and we can't let it end. So I hope he runs for the Senate." "The job that everybody has done is incredible," said President Trump. Trump continues to thank Rick Scott for the job he has has done. "The job that Rick has done is being talked all over." He also gives a shoutout to Florida Power and Light. He said, "They are well ahead of schedule." And he also thanks Attorney General Pam Bondi. Trump is effusive in praise for Florida Gov. Rick Scott. He said, "I hope this man right here runs for the Senate. ... Who knows what he's going to do." 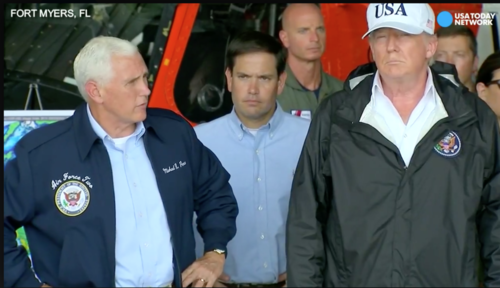 Trump, Pence and Rubio in Fort Myers on Sept. 14, 2017. President Donald Trump says he wants to cut taxes to help middle-class Americans, not rich ones. Trump seems to be backpedaling on comments Wednesday, when he suggested rates could go higher for rich people. Trump said then, "if they have to go higher, they'll go higher, frankly." He didn't say that Thursday, and he emphasized that wealthy Americans are not his priority. Trump said that "the individual rate coming down will be substantial for the middle class," adding those are the Americans he aims to "take care of." President Trump is now in Naples. 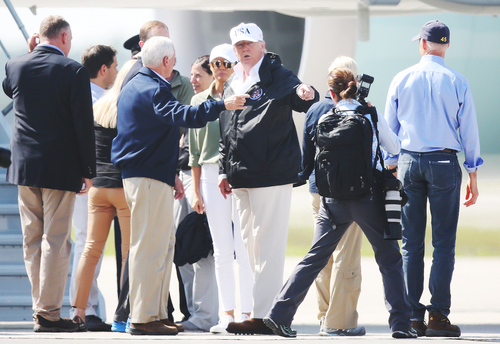 President Trump is aboard Air Force One at RSW and is headed back to Washington, D.C.
President Donald Trump handed out sandwiches and Vice President Mike Pence handed gave out bananas to people in a Florida mobile home community torn up by Hurricane Irma. They were joined by first lady Melania Trump at Naples Estates, a mobile home community for people 55 and older. Around them were piles of debris, including tall piles of siding, furniture and branches. The trio handed out food and posed for photos as people approached them. Most thanked them. One man yelled, "Make America Great Again!" Another told Trump that he "married well." Trump pledged to be "there for you 100 percent." 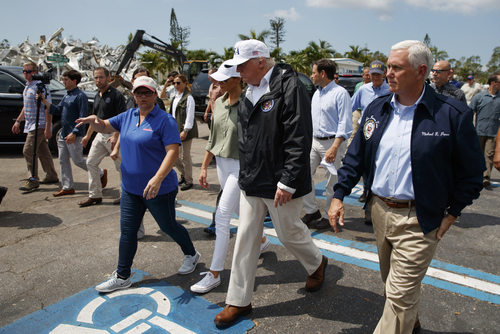 Trump is touring the storm damage in Florida, where many remain swamped and without electricity. Nearly 2.7 million homes and businesses, about 1 in 4 Florida customers, remain without power. Sewage backups have been reported. Trying to find out where and how many. Just left Florida for D.C. The people and spirit in THAT GREAT STATE is unbelievable. Damage horrific but will be better than ever! ...I told Republicans to approve healthcare fast or this would happen. But don't worry, I will veto because I love our country & its people. WE ARE WITH YOU FLORIDA!